This article is about the Yao ethnic group in Asia. For the unrelated Yao people, see Yao (ethnic group in Africa). The Yao nationality (瑶族, Pinyin: Yáo zú; Vietnamese: người Dao) is a government classification for a group of related minorities in China, including the Panyao, Mian, Jinmen, Shanziyao, Guoshanyao, Pindiyao and Baikuyao. They form one of the fifty-six ethnic groups officially recognized by the People's Republic of China, where they reside in the mountainous terrain in Hunan, Yunnan, Guangdong, Guizhou, and Jiangxi together with Guangxi Zhuang Autonomous Prefecture of southern and southwestern China. They also form one of the fifty-four ethnic groups officially recognized by Vietnam. In the last census, they numbered 2,637,421 in China, and roughly 470,000 in Vietnam. Most Western, Chinese, and Yao scholars believe that the Yao became an ethnic group during the Tang dynasty (618–907 C.E. ), when the term mo yao ("not subject to corvée") was first used to refer to the upland people living in the mountains of Hunan and northern Guangdong and Guangxi. In the early years of the Yuan dynasty (1279–1368), the Yao began to migrate southward to escape from the invading Mongols and the Chinese immigration encroaching from the north. From the fifteenth to the nineteenth centuries, agitated by the opium trade and disturbed by revolts in Southern China, the Yao migrated into Thailand, Cambodia and the highlands of Laos. Though they speak several different languages and follow a variety of traditions, the Yao people maintain a unique cultural identity which includes a rich oral literary tradition of song and legend. A Romanized written language was adopted in 1952. During the Shang and Zhou dynasties, the Yao's forebears began to establish a kingdom along the lower reaches of the Yangtze River. During the Sui Dynasty (581- 618), they separated from the Miao. Most Western, Chinese, and Yao scholars believe that the Yao became an ethnic group during the Tang Dynasty (618–907 C.E. ), when the term mo yao ("not subject to corvée") was first used to refer to the upland people living in the mountains of Hunan and northern Guangdong and Guangxi. The Tang government allowed these people to search for arable land in the mountains without the obligation of paying taxes. After the identifier mo ("not") was dropped in later dynasties, the term yao gradually became associated with the groups of upland people who traced their origins to an ancestral king, Pan Hu. It is possible that the Yao people did not become a distinct ethnic group until the Song Dynasty (960–1279), when the central government ruled the Yao areas with a jimi ("loose reins") policy and the tusi ("local chiefs") system, giving Yao chiefs autonomy over their realms, but requiring them to pledge loyalty to the imperial regime. By the early Ming dynasty (1368–1644), the central government replaced jimi and tusi with the policy of gaitu guiliu ("replacing locals with officials"), sending Han Chinese (the Chinese majority ethnicity) officials to rule the Yao areas; the Qing dynasty (1644–1912) continued the policy. The process of replacing locals, along with policies of ethnic discrimination during the Ming and Qing dynasties aroused resistance among the Yao. Before and during the Song dynasty, most of the Yao lived in the mountains, surviving by hunting, fishing, and slash-and-burn cultivation on hillsides, and living in communes. In the early years of the Yuan Dynasty (1279–1368), the Yao began to migrate southward to escape from the invading Mongols and the Chinese immigration encroaching from the north. By the early Ming dynasty, the majority of the Yao had settled in Guangxi, and smaller portions had settled in other provinces. The migration established the modern geographic distribution of the Yao population, and changed their livelihood to agricultural production, although those who remained in the deep mountains preserved their traditional way of life. From the fifteenth to the nineteenth centuries, agitated by the opium trade and disturbed by revolts in Southern China, the Yao migrated into Thailand, Cambodia and the highlands of Laos. Many Yao people joined the Taiping Rebellion (1850–1864) that originated in Guangxi. The Yao resisted attempts by the Nationalists (Kuomintang) to assimilate them into the national economy and culture. During the first two years after the founding of the People's Republic of China (1949), the government defined the Yao as a discrete nationality. Beginning with the establishment of the Longsheng Yao Autonomous County in Guangxi in 1951, during the next two decades the government established twelve Yao autonomous counties and over two thousand Yao autonomous towns or administrative villages. Under a policy of equality for all nationalities, the government trained Yao cadres and extended its political administration to the Yao areas through them. The Yao people in the deep mountains also began to give up slash-and-burn cultivation. During the Cultural Revolution (1966–1976), the government's work with minorities was halted when some Yao youths organized a Red Guards movement to rebel against local authorities, who consisted of both Han and Yao officials; religious rituals and traditional festivals were prohibited. In 1979, the government confirmed the rights and privileges of the Yao as a minority nationality and promoted their economic development. Since then Yao communities have experienced progress in agriculture, education, and health care. Reservoirs and hydroelectric power plants have been built; indigo, anise, and spices have been planted and are now important economic products; and the Yao mountainous regions have been developed for the timber industry and tourism. With more autonomous power under the government's reform policy, the Yao have also revived their traditions. But despite these developments, Yao communities are still poor in economic terms and far behind those of the Han Chinese. 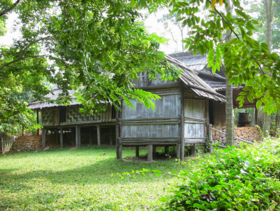 During the Laotian Civil War (1962 – 1975), Yao tribes of Laos cooperated with U.S. forces and were considered an “efficient friendly force.” This relationship caused the Laotian government to target Yao tribal groups for revenge once the war was over, triggering further immigration into Thailand, where the tribes were settled in camps along the Thailand-Laos border. After obtaining refugee status from the Thai government and with the help of the United Nations, many Yao people were able to obtain sponsorship into the United States, where they settled mostly in northern California and also in parts of Oregon and Washington state. Typical Yao houses are rectangular and constructed of wood and bamboo. A home is comprised of a central room and two dormitories on the lateral side, each equipped with a small oven for cooking. The staple foods of the Yao people are rice, corn, and sweet potatoes. Common vegetables include soybean, radish, bamboo shoot, and agaric. Most of the meat in their diet comes from their own domestic livestock and from wild animals that the men hunt. Generally, meals are eaten three times a day, one meal of gruel and two of rice. During the farming season, rice may be eaten three times a day. Often corn, millet, sweet potatoes, tapioca, taro, or fresh kidney beans are cooked in the rice. The main methods of cooking are stewing (sweet potatoes, bitter bamboo shoots) or roasting (corn on the cob, glutinous rice cakes). Dietary taboos prohibit the consumption of dog, cat or snake meat, and those who observe the folk religion known as Miluotuo do not eat the meat of sows or hawks. In the mountainous areas, the Yao take cold snacks to eat in the fields, gathering at mealtime to share the dishes they have brought from home. The Yao people retain a unique style of costume and adornment with certain variations according to the regions in which they live. Their clothes are primarily of blue cloth with various pictorial designs on the fabric. Men wear short shirts without collars, and jackets that may be buttoned in the middle or to the left and are normally belted. Trousers are blue or black, land may be long or of a short, knee length style. In places such as Nandan County in Guangxi province, men often wear white knee length knickerbockers. Yao people living in different regions have differing beliefs. Some worship nature, some revere their ancestors, and some worship totems. Medieval Chinese Daoism also plays an important role in the life of the Yao people, which includes the performance of ceremonial sacrifices. Some Yao people believe in wizardry.Many have converted to Buddhism and some to Christianity. Marriage is traditionally arranged by go-between who represent the boy's family to the girl's parents. If the union is acceptable, a bride-price is negotiated, typically ranging from three to ten silver bars, worth about US$100 each, a tradition left over from the opium trade. The wedding takes place in two ceremonies, the first at the bride's house, followed by a procession to the groom's house where a second ceremony occurs. In some regions, marriage by capture (in which the groom kidnaps the bride) is a tradition. Although they have a long history of living with other nationalities, the Yao people usually marry only other Yao. Half the Yao speak the Yao language, a Miao-Yao sub-group of the Sino-Tibetan language, but their dialects vary so significantly that Yao from different areas can hardly communicate with each other. The rest speak the Miao and Dong languages of two other minority nationalities. Because of their long historical tradition of migration and association with the Han and Zhuang people, many Yao can also speak Han and Zhuang languages. Their languages differ so much between regions that people from different areas have difficulty communicating with each other. Some linguists group the above languages - with a total of more than 287,000 speakers - together as dialects of a single Bunu language (Bùnǔyǔ 布努语). In addition to China, populations of Yao also live in Northern Vietnam (where they are called Dao), Northern Laos, and Myanmar. There are around 60,000 Yao in Northern Thailand, where they are one of the six main hill tribes. The lowland-living Lanten of Laos, who speak Kim Mun, and the highland-living Iu Mien of Laos are two different Yao groups. The Yao living in the United States are mainly refugees from the highlands of Laos who speak the Iu Mien language. The Iu Mien do not call themselves "Yao." A group of 61,000 people on the island of Hainan speak the Yao language Kim Mun, but see themselves as Miao (Hmong), and they are also officially categorized as Miao by the Chinese Government. 139,000 speakers of Kim Mun live in other parts of China (Yunnan and Guangxi), and 174,500 live in Laos and Vietnam. The Bunu call themselves Nuox [no13], Buod nuox [po43 no13], Dungb nuox [tuŋ33 no13], or according to their official name, Yaof zuf [ʑau21 su21]. Only 258,000 of the 439,000 people categorized as Bunu in the 1982 census speak Bunu; 100,000 speak Zhuang, and 181,000 speak Chinese and Bouyei. Han Chinese characters are widely used among Yao people, and Nv Shu (a special written language in South China used only by women), is used by Yao women. After the Eleventh Plenary Session of the Eleventh Central Committee of the Communist Party of China, the Guangxi Nationality Institute and the Chinese Academy of Social Sciences together created a new Yao writing system which was unified with the research results of the Yao-American scholar Yuēsè Hòu (约瑟•候). The writing system was finalized at a one-day conference in 1984 in Ruyan County, Guangdong, which included Chinese professors Pan Chengqian (盘承乾), Deng Fanggui (邓方贵), Liu Baoyuan (刘保元), Su Defu (苏德富) and Yauz Mengh Borngh; Chinese government officials; Mien Americans Sengfo Chao (Zhao Fuming), Kao Chiem Chao (Zhao Youcai), and Chua Meng Chao; United States Linguist Herbert C. Purnell, who developed a curriculum and workshop presentations on language learning in East and Southeast Asia; and Yao Seng Deng from Thailand. The US delegation took the new writing system to the Iu Mien community in the United States where it was adopted with a vote of 78 to 7 by a conference of Mien American community leaders. This writing system based on the Latin alphabet was designed to be pan-dialectal; it distinguishes 30 syllable initials, 121 syllable finals and eight tones. There is a separate written standard for Bunu, since it is from the Hmong/Miao side, rather than the Mien/Yao side, of the Miao-Yao languages family. Officially illiteracy and semi-literacy among the Yao in China still stands at 40.6 percent, as of 2002. ↑ Death of A Shaman, Independent Television Service. PBS.org. Retrieved November 20, 2007. ↑ Yao, ChinaTour360. Retrieved November 14, 2007. ↑ Yao Ethnic Group and its typical foods, teaw.com. Retrieved November 14, 2007. ↑ Yao, Travel China Guide.com. Retrieved November 14, 2007. ↑ Yao,ChinaTour360.com. Retrieved November 14, 2007. ↑ Yao Ethnic Group and its typical foods, .Teaw.com. Retrieved November 14, 2007. ↑ Yao, ChinaTour360.com. Retrieved November 20, 2007. ↑ Yao, ChinaTour360.com. Retrieved November 14, 2007. ↑ Yao, TravelChinaGuide.com. Retrieved November 20, 2007. ↑ Yao, bookrags.com. Retrieved November 20, 2007. ↑ Raymond G. Gordon, Jr. (ed. ), Iu Mien. 2005. Ethnologue: Languages of the World, Fifteenth edition. Dallas, Tex. : SIL International. Retrieved November 21, 2007. ↑ Kim Mun. Ethnologue: Retrieved November 21, 2007. ↑ Biao Mon. Ethnologue: Retrieved November 21, 2007. ↑ Dzao Min. Ethnologue: Retrieved November 21, 2007. ↑ Biao-Jiao Mien. Ethnologue: Retrieved November 21, 2007. ↑ Bu-nu. Ethnologue: Retrieved November 21, 2007. ↑ Wunai Bunu. Ethnologue: Retrieved November 21, 2007. ↑ Younuo Bunu. Ethnologue: Retrieved November 21, 2007. ↑ Jiongnai Bunu. Ethnologue: Retrieved November 21, 2007. ↑ Lakkia. IEthnologue: Retrieved November 21, 2007. Barker, Judith C. & Saechao, Kaochoy. "A demographic survey of Iu-Mien in West Coast States of the U.S." in Journal of Immigrant Health 2(1)(2000): 31-42. Barker, Judith C., and Saechao, Kaochoy. "A Household Survey of Older Iu-Mien Refugees in Rural California." in Journal of Cross-Cultural Gerontology 12(2) (1997): 121-143. Forde, Cyril Daryll. Yako Studies. London: Published for the International African Institute by the Oxford University Press, 1964. Máo Zōngwǔ 毛宗武: Yáozú Miǎnyǔ fāngyán yánjiū 瑶族勉语方言研究 Studies in Mien dialects of the Miao nationality. Běijīng 北京, Mínzú chūbǎnshè 民族出版社 2004. ISBN 7105066695. Méng Cháojí 蒙朝吉: Hàn-Yáo cídiǎn - Bùnǔyǔ 汉瑶词典——布努语 Chinese-Miao Dictionary - Bunu; Chéngdū 成都, Sìchuān mínzú chūbǎnshè 四川民族出版社 1996. ISBN 7540917458. Mitchell, J. Clyde. The Yao Village; A Study in the Social Structure of a Nyasaland Tribe. [Manchester]: Published on behalf of the Rhodes-Livingstone Institute by Manchester University Press, 1956. All links retrieved July 30, 2013. Death of a Shaman. Directed by Richard Hall; produced by Fahm Fong Saeyang. The Yao ethnic minority (on a Chinese government website). This page was last modified on 30 July 2013, at 20:51.